Planning for your retirement is probably the most challenging times of a dentists career. You've spent the majority of your life doing dentistry, and now comes a time when you need to consider how and when to exit. If you don't have a few hobbies, grandchildren, vacation home etc to keep you busy, there's not much to look forward to in retirement, so its easy to just procrastinate and just keep doing what you are doing. This is risky, there's a lot that could happen with your health that could cause you to exit before you wanted to, leaving you in the position to make a quick decision to sell fast for a fraction of what you expected. Even worse in the extreme case if you had a fatal incident, you'd be leaving your family with the responsibility of trying to figure things out and potentially taking so long to sell the practice that its worth next to nothing. To avoid this we need to start discussing your options and strategies early on, at least 5 years before you intend on retiring. Together we can determine the best next steps, call or email me and lets get the conversation started before it's too late. At minimum we need to start looking at what it takes to prepare your practice to either attract an associate or attract a buyer. Its like selling a house, you usually need to update a bathroom and paint some walls, it's no different with a dental practice. There are certain things a young dentist "needs" to perform modern day dentistry, you need to be prepared for this or the process of finding a buyer may take forever. We have a few great resources available to help you with your transition. I have have assisted customers on multiple occasions to find an associate to purchase a practice, which simplifies the process and saves money! Patterson owns Mercer Transitions, called Patters Connect which has been in the business of transitions for many year, more info below on this service we offer. I also am very close with and have worked with Ed Ferrero who now handles the MA and RI markets with DDSMATCH.COM, which I have also highlighted below. Mercer Transitions have helped thousands of dentists execute every type of transition you can imagine. Our goal has always been to help dental practice owners and associates find each other and implement a successful win-win practice transition, whatever that may look like. 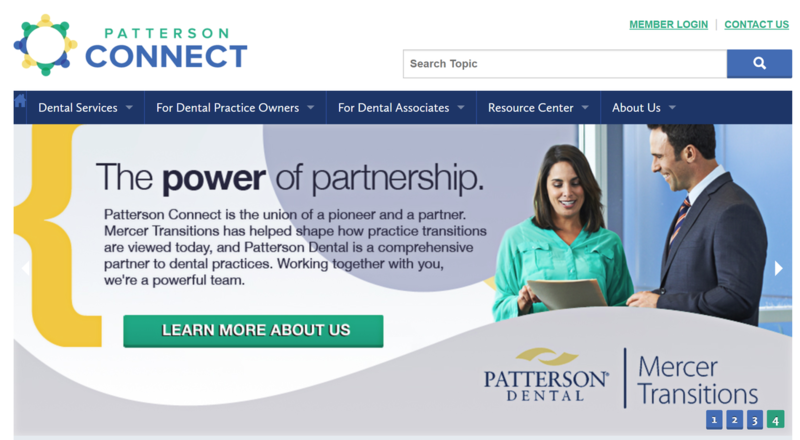 Now with Patterson Dental and the evolution to Patterson Connect, we look forward to helping you next. Whether you are looking for a dental practice buyout, a partnership, acquisition of a second dental practice, the merger of two or more dental practices, or just need guidance on your options, we are here to ensure you get the support you need through the entire process. Thad Miller, founder of ddsmatch.com, envisioned a better way for dentists to make practice transitions by pairing technology with a human touch to produce a professional and exacting match. Professional advisors serve their clients in their respective areas at the highest level. ddsmatch specializes in connecting buyers and sellers by integrating tremendous relationship capabilities, using a unique process for dentists "The Trusted Transition Process,” supported by a robust website and professional advice. Fair, dependable Third Party Business Valuations and practice appraisals supported by accredited professionals. An interactive website that allows you to search for a practice buyer or partner for your practice. Kolbe testing to better assess the nuances of potential matches between dentists and their associates.